so you can focus on the content and get the results you need. Put the system in the room. Listen to all voices. Access group wisdom. Lead from the emerging future. Addressing the complex local and global challenges of our time requires navigating uncertainty and opening the door to the power of emergence. Today's "wicked problems" ask of us that we access new potentials within and around us to generate systems and solutions that are aligned with life. No single leader will discover the answers we need: these times call on us to access the intelligence and creativity of the collective. 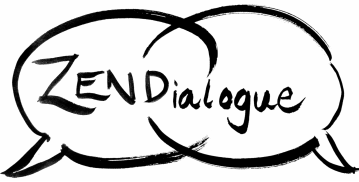 ZENDialogue will support you by holding space and facilitating processes that activate the wisdom in your group. "Thank you for facilitating decision making on future of ICPNC. Your facilitation of the day was excellent. With your thoughtful planning we were able achieve what we had set out to do." The Group Works deck of 100 full-colour cards (91 patterns + 9 category cards) names what skilled facilitators and other participants do to make things work. The deck can be used to plan sesssions, reflect on and debrief them, provide guidance, and share responsibility for making the process go well. The e-version is free! Facilitating with Heart: Awakening Personal Transformation and Social Change, by Martha Lasley, is a book that integrates best heart-connected practices in the field of facilitation. You'll find resources and inspirational stories from facilitators, coaches and social change activists from around the world. Available in print or e-book versions. 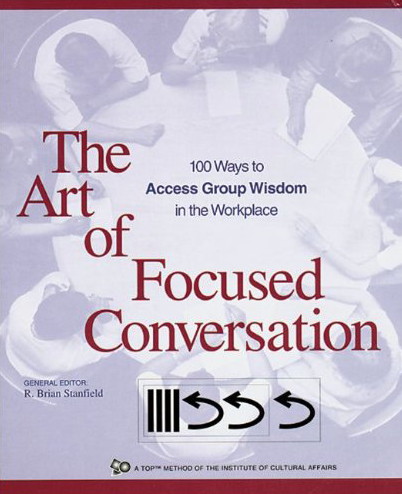 The Art of Focused Conversation is an invaluable resource for facilitators and anyone working to improve organizational communications. It describes the conversation method, and then provides 100 sample conversations for situations from planning to decision-making and reviewing.